Gayle has been remiss in writing any new blog posts for the past two months as we have been traveling after moving out of our house in Vernon, British Columbia on May 11. 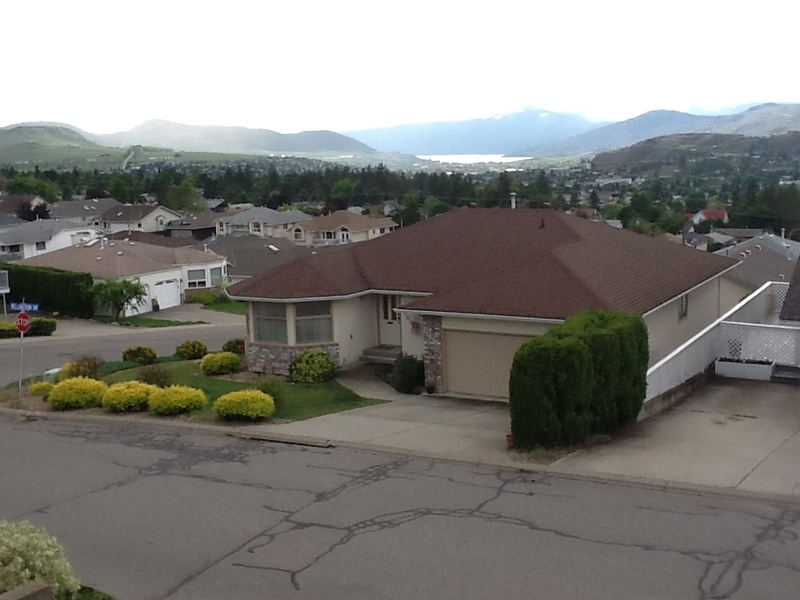 We spent another almost-two weeks on the other side of town at an apartment borrowed from friends where we had a beautiful view of the sprawling town below and the area we used to live in around Okanagan Lake in the distance. We had delayed our departure so that Gayle could attend a wonderful and challenging three-day Chorfest sponsored by the British Columbia Choral Association. The choir festival was held in Vernon this year, so it was too good an opportunity to pass up. Here is our whole group rehearsing for the finale of our final concert – a lively and moving African number. 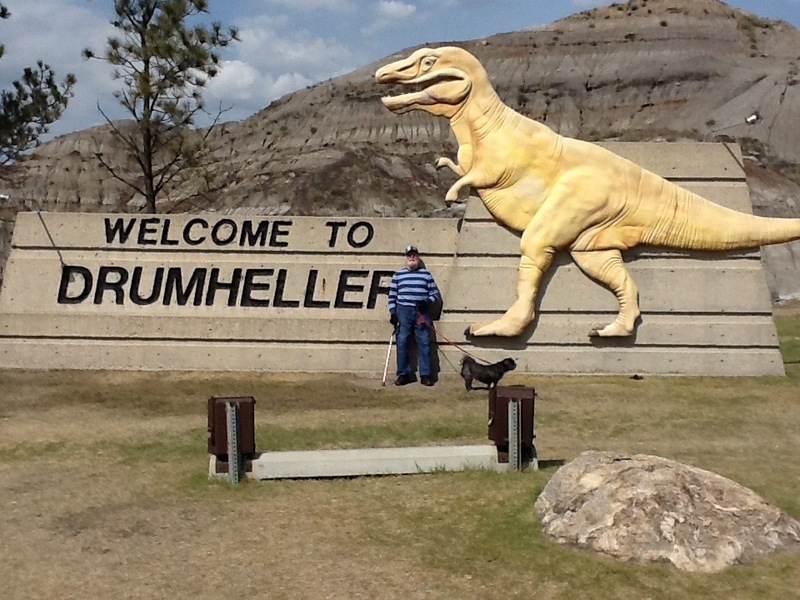 Then we headed east for a grueling three-day car trip through eastern BC and the Rocky Mountains, past the Badlands in Alberta, where we had a stop to photograph Ian and our dog Misty posing with a dinosaur at Drumheller. This time we didn’t tour the Dinosaur Museum as we had done some years ago. 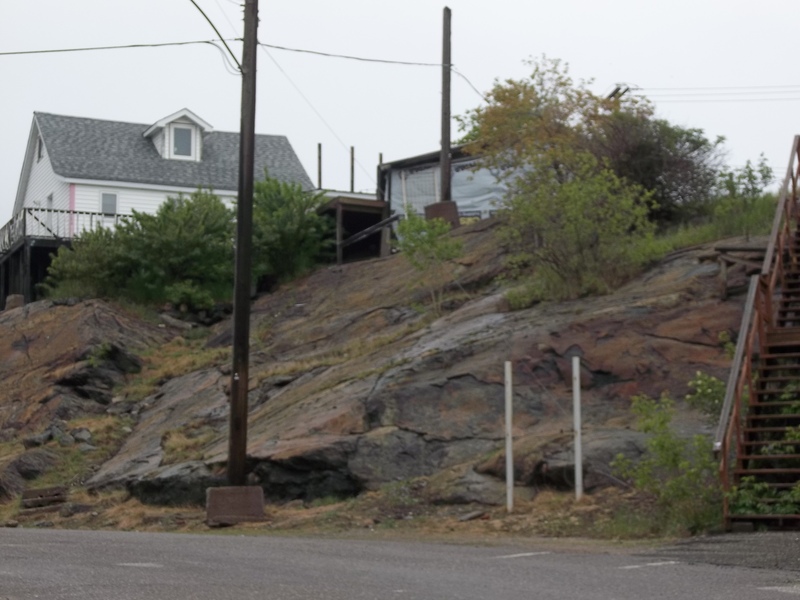 Continuing northeast through the expanse of Saskatchewan prairies, we finally crossed the Saskatchewan/Manitoba border into the northern Manitoba mining town of Flin Flon, built almost entirely on rock and surrounded with forests and lakes. There we had three weeks to recover and relax with Ian’s daughter and her family. Our little Shihpoo, Misty, had not been a happy doggie for the past months, sensing some big change was coming as soon as Gayle had begun to pack up our books in early April. She commenced to show us her anxiety by starting to pee on the carpet in the library/sewing room/second bedroom where the packing was taking place. Unhappily, this continued in our borrowed apartment so that we finally bought her doggie diapers for the trip east. 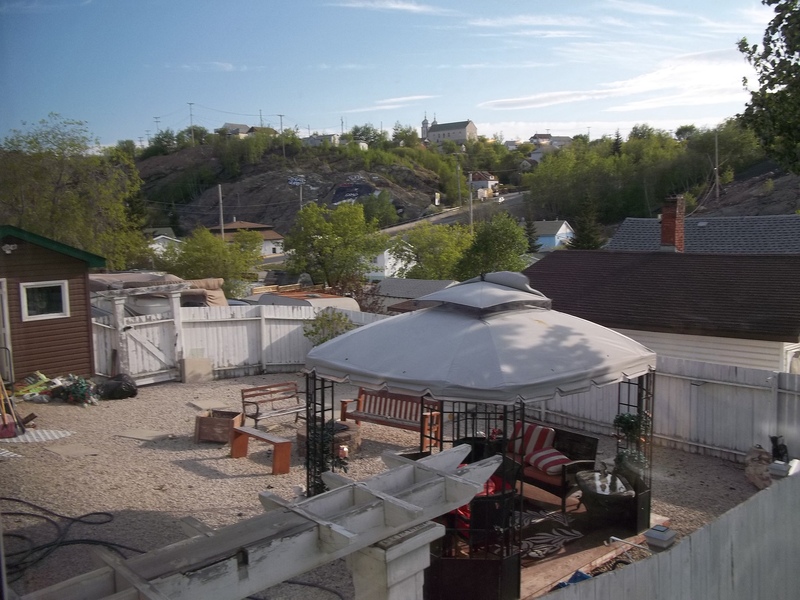 Once we got settled in Flin Flon, however, most of her household “accidents” abated. She spent her time those three weeks (when she wasn’t ensconced on Ian’s lap) getting acquainted with daughter Shirley, her house, husband and their dog, Daisy, a Boston terrier. 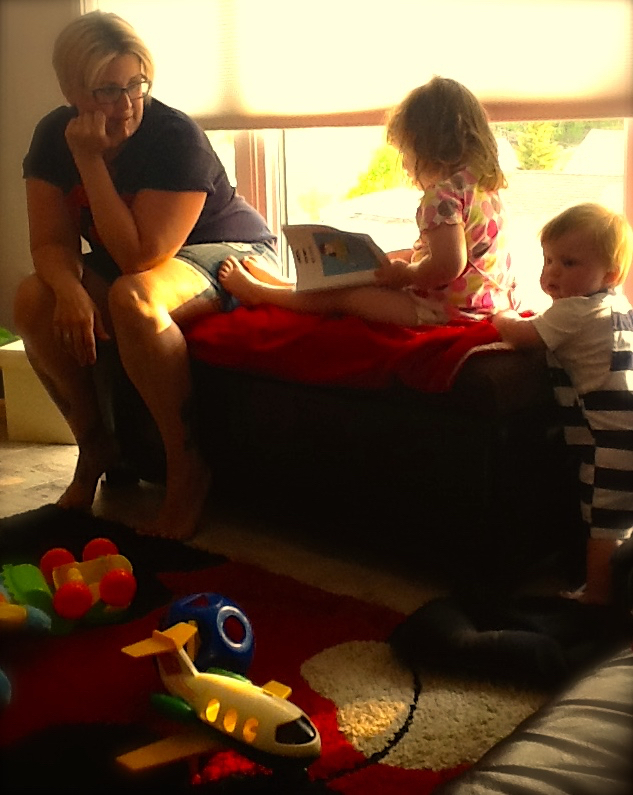 She also met our married grandchildren and their four toddlers. Below is a photo of the 14 of us (including dogs) one afternoon when we all managed to get together at the same time and place. 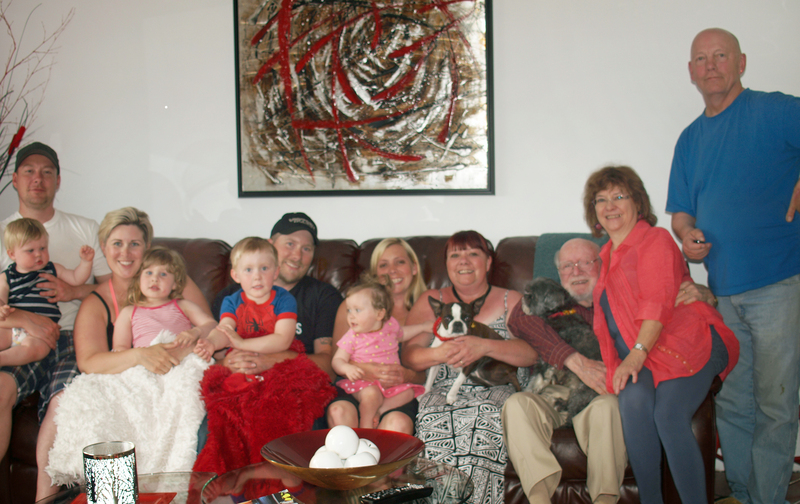 Luckily, our grandchildrens’ four dogs weren’t present or we might not have got all of us into one photo. Beside the fact that our new apartment in Winnipeg wasn’t ready for occupancy until June 19th, our ulterior motive for staying in Flin Flon for three weeks was to be sure that Misty would be happy there. You see, we can’t have a pet in our new home, a seniors’ life-lease apartment. Misty was already warming up to her new “parents” by the time we left, although she and Daisy still are a bit wary of each other. Time will tell whether they ever become friends, though they are now “sisters.” Ian, especially, misses her terribly but realizes our parting was necessary. 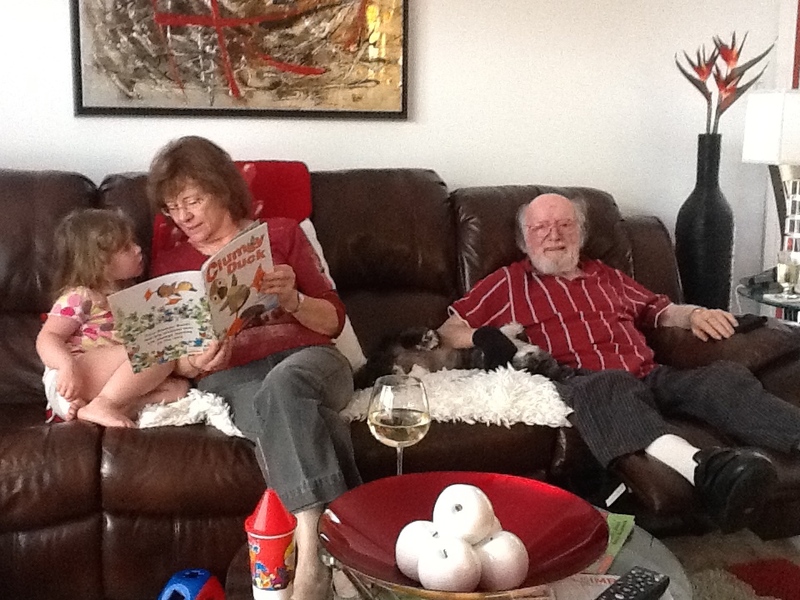 Previously, we had only met one of these great-grandchildren. Brayden who is now approaching his 4th birthday, introduced us to Lexi, 3, Haylee and Alex, both going on two and just learning to walk. We presented them with copies of our latest book, Jake, Little Jimmy & Big Louie, which had been dedicated to the youngsters in our blended families and were delighted when Lexi eagerly opened her copy to give it a once-over, while her little brother looked on. She also enjoyed being read to. 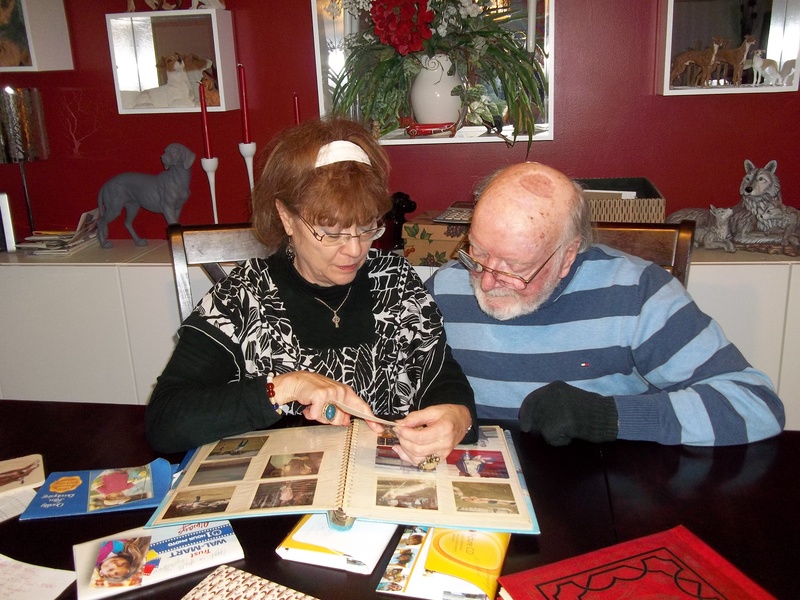 While in Flin Flon we took the opportunity to go through some boxes of photographs we had brought along. As Author Ian has been finding it difficult to answer Editor Gayle’s many questions while she is editing our next book: Ian’s second memoir entitled Came to Canada, Eh? Continuing a Scottish Immigrant’s Story, Gayle was hoping to jog his memory through old photographs. She also enlisted daughter Shirley, who had experienced the immigrant situation with her dad, mom and sister, to identify some of the people and places in the photographs. This was a big help. We plan to repeat the experience now that we are settled in Winnipeg and can rely on the memories of Ian’s other daughter living nearby. Some of Gayle’s questions, however, may never be answered. Though she is still enjoy the editing, this book is proving more of a challenge than past books have been. Below you will find a link to an article in The Guardian that we have found helpful in understanding the dilemma of memory loss that so tragically accompanies cognitive impairment and how that specifically affects artists. How grateful we are that Ian wrote so much and so well while his memory was good. This entry was posted in autobiographical story, Canadian theme, Co-authoring, dementia, Editing, family heritage and tagged Alberta, arts, British Columbia, choral festival, dinosaur, family get-together, Flin Flon, Manitoba, memory loss, moving, pets, Saskatchewan, travel, writing. Bookmark the permalink. We use WordPress and are happy with the helps it gives to bloggers. Thanks for your comments.